3.5x4 Custom Magnets - Outdoor & Car Magnets 55 Mil Round Corners are a great solution to display your brand to the world outside. These custom rectangle and square magnets are outdoor safe and have outstanding durability to stay unmoved for many months. They are ideal for the promotions of trucking companies, logistics and even hospitals. Make the most of the full color processing and free design facilities to achieve a good impact from your promotional efforts. Order these custom magnets today to get lowest price guarantee, no set up fee and free shipping in the contiguous USA. 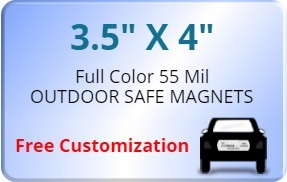 Request a quote to know price cuts that you can avail for wholesale 3.5x4 Custom Magnets - Outdoor & Car Magnets 55 Mil Round Corners.